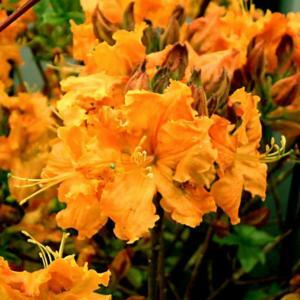 Dense trusses of large, scented, flame orange flowers with a warm yellow flare and slightly frilled petals during May and June. Upright bushy habit. Very popular. Moist, well drained humus rich acid soil. Thrives in full sun. Reputed to be exceptionally hardy and of robust constitution. Knap Hill hybrid deciduous azalea, introduced in 1947.